My healing practice, as it stands today, is the culmination of many, many years of training and studying with a myriad of teachers from around the world. Layer by layer, I have added a host of healing modalities into my practitioner toolkit so that I may give my clients the perfect combination of services with an efficacy of optimal benefit for each individual. Not everything will work for everybody. In every session or class, I rely on Spirit to guide me to the means that will best serve the client. Through continual practice, I have sussed out the precise healing tools that I can confidently deliver, with the highest proficiency, for my clients and my students, all of whom come to me with faith and trust. I treat their trust with complete respect and honor. Many of my healing services are familiar to most people with offerings like chakra balancing, card readings, meditation guidance, vibrant nutrition, conscious relationship counseling and so forth. And again, most people have a moderate understanding and comfort level with these type of services. All of these modalities are truly beneficial and are beautiful stepping stones on my clients’ paths to wellness. There is one offering within my practice that I can safely say is probably NOT nearly as familiar to the general population. It is also important to note, it is a healing modality that pushes the boundaries of the human psyche, allowing participants to truly toe the edge of their comfort zone. What I am describing is one of my signature services called Shamangelic Breathwork. There are a variety of Breathwork approaches out there and equally varied ways it can be facilitated. My method incorporates the things I have learned from many Shamanic teachers and also from the tenderness of my Angelic Guides, and it was important to me to develop my own unique approach to Breathwork. 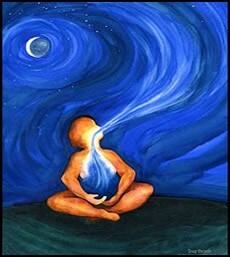 Breathwork is essentially a deeply emotional journey that is transformative and transcendent. It can be done in private sessions or in group ceremonies and is considered a very sacred practice. It is also extremely personal for each individual, with no two experiences ever being alike. A profound release of fear and tensions can be achieved through guided breathing and hyper-oxygenation of the body and brain. From this deep, focused breathing, a hi gher state of consciousness may be induced and it has the remarkable capacity to quickly release deep wounds or traumas. Breathwork is emotionally intense and can initially seem scary. Because of the highly sensitive state it brings people into, it is best to be guided by a trained practitioner in a space that is completely safe and loving. It is an experience that is available to anyone but must be met with courage, intention and openness. If that mindset is in place, a truly extraordinary journey will follow! If you’re interested in having a private session with me that channels the healing process through Breathwork, I am available by appointment, year-round, at Shamangelic Healing Center in Sedona, AZ. There are also times when I will hold small-group Sacred Breathwork Ceremonies that are open to the public. The ceremonies are a wonderful combination of music, sound & energy healing, along with guided visualizations that lead the participants into a deep Breathwork journey. Please check my calendar for when these are scheduled. Alternatively, if you’re a practitioner interested in adding Shamangelic Breathwork to your own practice, I hold training courses in Sedona at various times during the year. The Shamangelic Breathwork Facilitator Training Course is a 9-hour intensive class that teaches you how to use Breathwork as a healing modality for your own clients. At the end of the day, you will help me co-facilitate an actual Shamangelic Breathwork Ceremony for a small group. Because of the sensitivity needed to properly employ Breathwork for clients and the deeply emotional responses it can invoke, comprehensive training is a must. Therefore, it is a requirement to complete both my Empowerment & Awakening Course along with Healing Tools & Modalities Course prior to enrolling in the Shamangelic Breathwork Course. These core classes will be held again in March 2016. I truly look forward to sharing this amazing process with you, so please be in touch with any further questions you may have. Blessing to you all!